Bake the number of round cakes you want for balloons (see Birthday Cakes for a First Birthday article for Madeira sponge recipe) either in cake tins or 2 pint pudding basins-to get more of a balloon shape. Use loaf tins to bake your cake mixture in too for a different balloon shape-or buy a Swiss roll and decorate it to match the others...(not cheating, just improvising! )Once the cakes have cooled completely, they can be cut in half horizontally and filled with a jam of your choice and butter-cream. Prepare the cake board by covering it with ready-made sugar paste (available in cake shops and supermarkets in a range of colours)rolled to a thickness of about 4mm. If the paste gets sticky, use a light dusting of icing sugar to keep it workable. With the rolled paste over your rolling pin, transfer it to the cake board by unrolling it to fit, then, use the rolling pin to roll it firmly into place. Cut any excess with a plain-bladed knife to give a neatedge. If you are using more than one cake board use different colours of sugar paste for extra ‘eye appeal.’Alternatively, cover your cake boards with doilies or edible paper! Roll the paste as before- make sure it is large enough to cover the cake-or Swiss roll-before attempting this. Using the rolling pin as a ‘coat hanger’ to move the rolled sugar paste, have the cake as close as possible to avoid disasters. Drape the paste carefully over the cake without pressing it. Smooth the paste on with your hands, starting at the top in the centre, to avoid trapping air bubbles. Once the top and sides are covered, trim any excess at the base; press this part firmly first to anchor the covering. If your cake needs a little extra sticking power to secure it to the cake board, brush on some apricot glaze: 3 tablespoons apricot jam mixed with 1 teaspoon water in a saucepan, heated gently to melt the jam. Put this sticky mixture through a sieve and use the back of a spoon to rub the jam through it. Use a thin paintbrush to apply where necessary. Make ‘knots’ for your balloons with the trimmings of sugar paste and use either thin ribbon or liquorice strands as balloon strings. If you have more sugar paste trimmings, or just some you want to use up, have a go at making numbers with them. For example, if the cake is for your child’s 4th birthday, make a paste number 4 to go on each balloon by rolling the paste and cutting it to the required shape. For added ‘oooh’ factor, decorate the board and balloons with sugar mice or other little edible creatures that can be bought readymade! 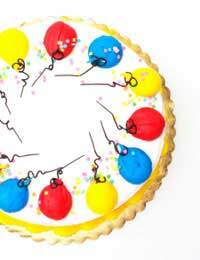 Bake and ice the cakes but draw different coloured balloons on the top of the cakes with food writing gel. Quick and simple.